Pancreatin USP is a pancreatic enzyme derived from porcine. Pancreatin USP has 3 digesting enzymes; protease (protein digesting), amylase (carbohydrate digesting), and lipase (fat digesting). 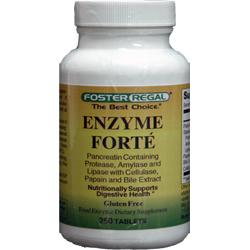 Our Enzyme Forte' is a combination of natural enzymes that include Papain, Bile Salts and Cellulase for complete digestive support. Other ingredients: Calcium phosphate, vegetable stearic acid, vegetable cellulose, silica, vanillin. Directions: As a food enzyme dietary supplement, take 1 tablet with each meal and if necessary at bedtime. Don't hesitate to use two servings (two tablets) with each meal and at bedtime if needed.